H. JOAQUIN JACKSON - Haynie Joaquin Jackson was born in Anton , Texas . 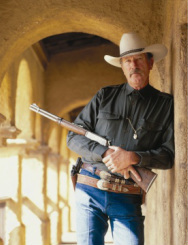 His career as a Ranger from 1966-93 spanned the era in which the Texas Rangers became a modern law enforcement agency and the very definition of “Texas Heroes.” The retired Ranger found himself elevated to the personification of the modern Texas Rangers after he was featured on a 1994 cover of Texas Monthly magazine. After retiring, he appeared in several movies, including The Good Old Boys with fellow Texan Tommy Lee Jones, The Rough Riders, Streets of Laredo, Palo Pinto Gold and Poodle Dog Lounge. Currently a resident of Alpine, Texas , the former college basketball player still has a long reach in the storied history of Texas and the Rangers. Joaquin Jackson remains the emblem of what a Texas Ranger and a Texas Hero should be.